The ASTM requires structural bolts to be distinctively marked. These bolt head markings include the manufacturer’s mark, the grade of bolt (ex. 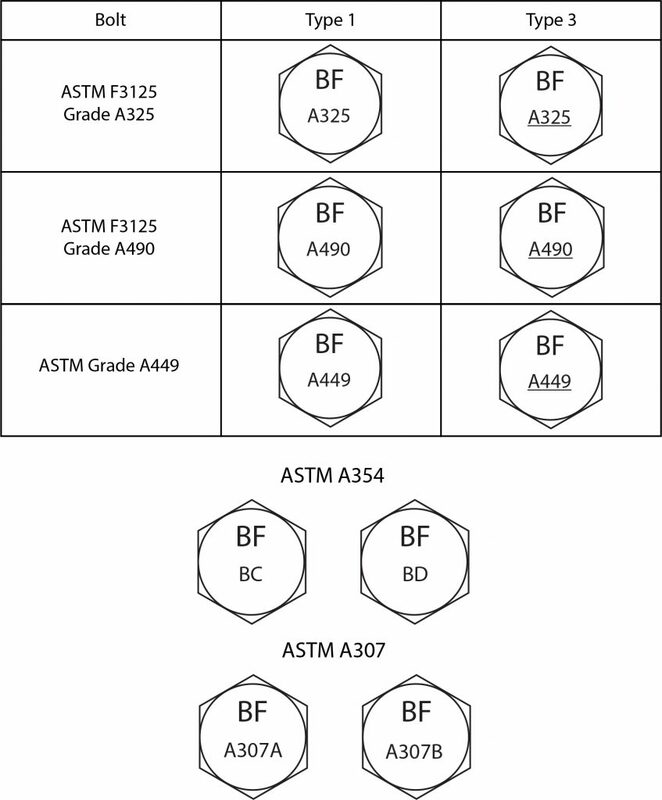 A325, A490), and markings to classify the type of bolt (Type 1 or Type 3). In addition to the mandatory markings, certain manufacturers may include additional markings to distinguish them from others. Below are the mandatory bolt head markings using our manufacturer’s mark. To learn more about our structural bolting products, visit our main structural bolting page. White rust is a common problem in the structural steel industry. It is typically caused by improper jobsite storage and a lack of air circulation. Aside from it harming the physical appearance of the bolt, white rust can break down the layer of protective coating on the bolt. 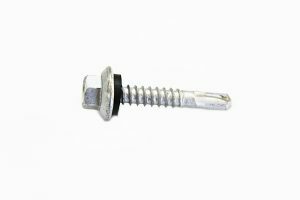 Many structural bolts are galvanized for their protection and durability. This galvanized coating is made of zinc, which is one of the best ways to prevent corrosion on steel. White rust is made up of zinc hydroxide, which is formed when zinc reacts with water and air. Zinc hydroxide is unstable and consumes the protective zinc coating. This typically happens when fasteners are “nested” together (packed flat one on top of another) and water gets in between the fasteners. It looks like white powder covering the surface of the coating (see image below). Fortunately, there are a few simple ways to prevent white rust from forming on your structural bolting components. Proper jobsite storage is something we often stress, because it is the number one way to prevent issues with fasteners. There is always a greater chance for white rust formations when fasteners are improperly stored outdoors and exposed to the elements. 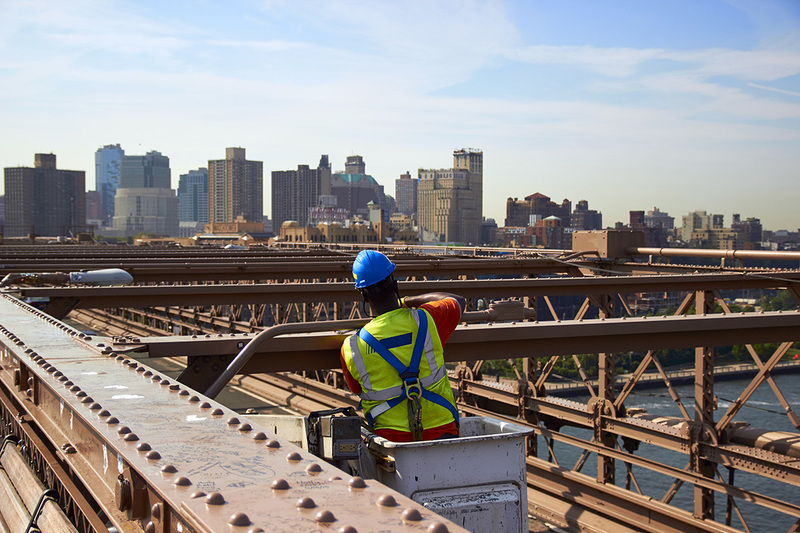 It’s important to make sure your fasteners are receiving proper care from the moment they enter your jobsite. When the fasteners are delivered, make sure they are stored properly at the time you receive them. For more information on proper jobsite storage, check out our blog post. As we mentioned, when fasteners are “nested” together, white rust is more likely to form due to a lack of air flow and moisture getting trapped in between the fasteners. Fasteners are sent in bins that ensure proper air circulation. It’s important to keep the fasteners stored in a way that maintains air flow and allows any moisture to evaporate. White rust typically occurs when fasteners are stored improperly and exposed to moisture. Be sure your products are not “nested” and have proper air circulation to prevent white rust from forming. Though there are ways to treat white rust (depending on severity), prevention will save you time, money, and frustration. As always, proper jobsite storage is vital to the protection of your fasteners. Torque vs. Tension – What’s More Important in Structural Bolting? Often, our customers will ask us to discuss torque values in regards to pretensioning structural bolts. Birmingham Fastener makes it a point to educate our customers on the difference between torque and tension and the importance of measuring tension of structural bolts. Torque is often associated with installation tightening or inspection of structural bolts. Bolts are tightened in order to achieve tension – torque is only a by-product of this relationship to reach proper tension. Torque can vary greatly in this relationship to reach the desired tension, therefore, Birmingham Fastener stresses that you focus on tension first and foremost. Lubrication, bearing surface condition, thread fit, and the use of a flat washer are some of the variable in the torque-tension relationship. About 60% of the torque required to tighten a bolt is consumed by overcoming the friction between the nut and the flat washer, about 30% overcoming the friction between bolt and nut threads, and 10% to elongate the bolt. According to multiple tests, torque-tension relationships can vary by as much as 40% for structural bolts. Torque charts are not permitted to be used for installation or inspection. 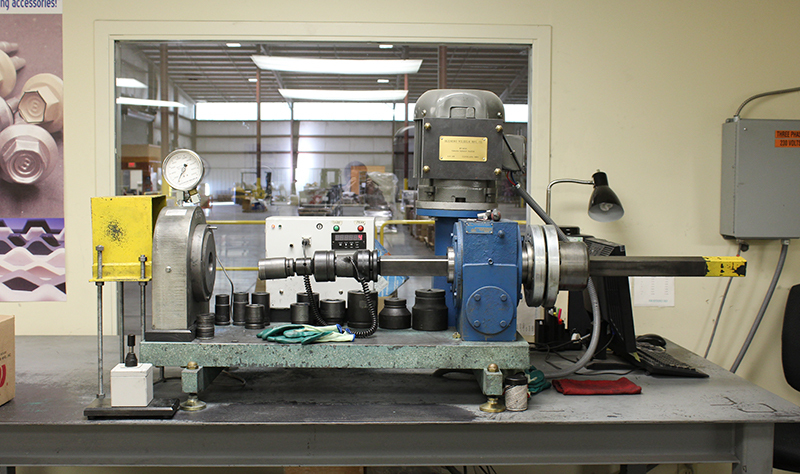 The only accepted method is the use of a Skidmore Wilhelm device (Bolt Tension Measurement Device) to actually measure tension, then proceed to measure the torque required. The charts below are listed for convenience and can be used to estimate the torque ranges for our structural bolts. An accepted industry value for K is 0.0167. That said, lubrication or a lack of lubrication can cause the K factor to range from 0.01 to 0.025. The tables below are estimated of the approximate torques for F3125 Grades A325 and A490 structural bolts. Because torque can vary so greatly, these tables are not to be used for installation or inspection purposes. Note: These are estimates only and are not to be used for installation or inspection purposes. Torque can vary greatly depending on several factors listed above. Tension is actually what you are trying to achieve. brands of flashings that provide a tough weather-tight seal and a flexible base. 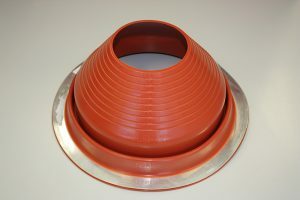 The unique cone design provides continuous contact with flashed pipe for a long lasting seal. All are clearly marked with metric and imperial sizes for easy cutting and have a twenty year manufacturer warranty. Available in black EPDM, gray EPDM, and red silicone. 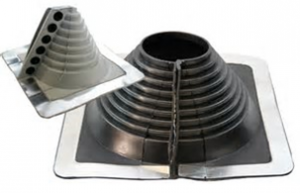 Retrofit flashings have a zipper or snap that allows the flashing to wrap around existing or difficult to access pipes for faster installation. These snap together in seconds with a built in crimp. This means no loose rivets or clips to worry about, and the aluminum base conforms to the roof. 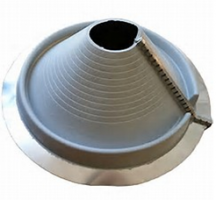 Strip flashing flashes between dissimilar material including hi-rib and standing seam profiles. It stretches and forms to fit and seal. In addition to these features, it handles vibration and expansion well.